Can’t believe it’s already the new year. Is it just me or did 2014 completely fly by? All I know is that the holiday season went by in a flash and all I have left to remind me is a completely messy and unorganized house. But, after getting to spend time with friends and family, I can totally be okay with that. But, it’s time to get things in order around here. Recently I was sent an interesting and downright fun book called “Life Hacks” by Keith Bradford. How could I refuse checking this out? It’s the kind of book with all types of tips you may or may never use, but who cares. It’s just that cool. From cures to cleaning hacks, this book is jam packed with fun tips and ideas. On top of all the chaos around here, we got the idea that we should move right away. We’ve been renting while we gear up to buy a new home for the past 7ish months. It’s been quite a challenge adjusting to a smaller space. We tried to be flexible and cram things into tiny quarters, but we’ve hit a limit. Now we’re on a mission to downsize, recycle, donate and get ourselves moved into something much bigger asap. We’ve come to terms that we’re just not ready to make a permanent decision and that it’s totally OKAY darnit. We’re paving our own way and carving out our own path and we’re kind of excited. We feel completely liberated. (I need to bottle that feeling.) Cracking open the Life Hacks book came at a good time for tips on solving problems, simplifying tasks and reducing frustration in everyday life. Sounded like the answer to pretty much all of my needs this January. So, let’s get down to it. I have to admit that I’ve never, ever thought to use newspaper to clean. I will however be using it to pack with, that’s a given. I really enjoyed these clever ideas in the Life Hacks book and hope you’ll benefit from them too. Yes! Finally ways to use old newspaper to actually make our homes cleaner instead of just sitting in an unsightly pile in the corner waiting to be recycled some day soon. Without further blabbing, check out these tips compliments of the Life Hacks book. When we first moved into this apartment, I was sure these were the most filthy windows I’d ever laid eyes on. There were dog nose marks everywhere on top of it. Months later, I found out that the previous renter did not have dogs. That’s right. They were actually from the renter BEFORE that. It made my skin literally crawl. 1. #887 If you want streak-free shine on windows, use newspaper. There’s nothing worse than a stanky and leaky trash bin. Trash is one my least favorite things to deal with, aside from dishes and laundry of course. This is a brilliant trash hack! 2. #897 Put old newspaper at the bottom of your trash bin. It will absorb any food juices and make for a cleaner disposal. Okay. Gross confession. I was cleaning out my fridge a few weeks ago and I left a container filled with refrigerator cake in it on top of my stove. It was left there for at least two days, oops. I’ve never smelled anything more rancid. It took me about 4 re-washes to get the stank out of my container. This next tip would have really come in handy! 3. #918 Food container smell bad even after you’ve washed it? 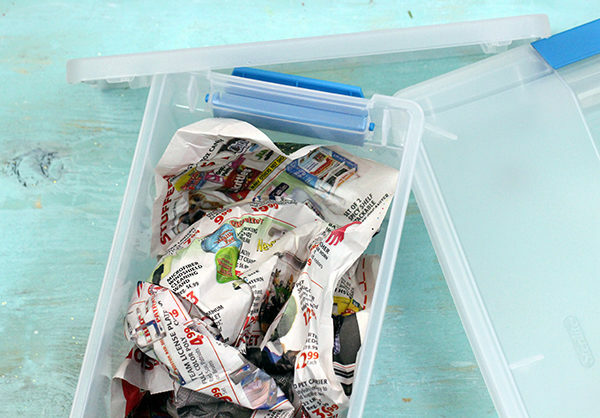 Toss in a crunched-up piece of newspaper and leave it overnight. The smell will be gone by the morning. And that’s a wrap! 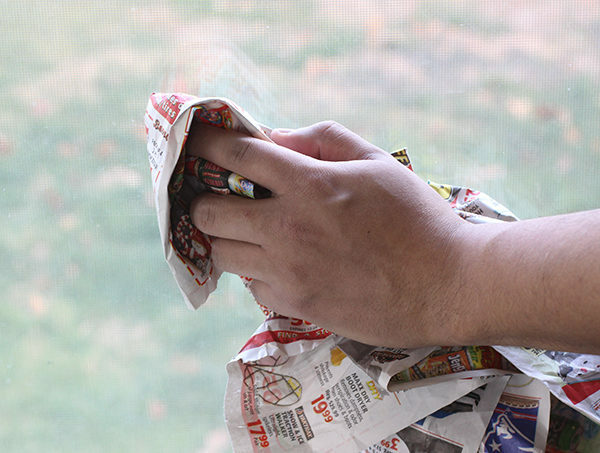 You can totally keep your home cleaner with the help of newspaper. I’m impressed! Want more awesome tips? You can purchase the ↘ Life Hacks book on Amazon. This would be an awesome gift for anyone, I can really see this as a gift for new parents, new homeowners or new homemakers and totally for college students. So, I’m curious. What do you do with your old newspapers? Have you ever used them to clean? We have been using it to clean our windows and mirrors for years. It works like a charm. 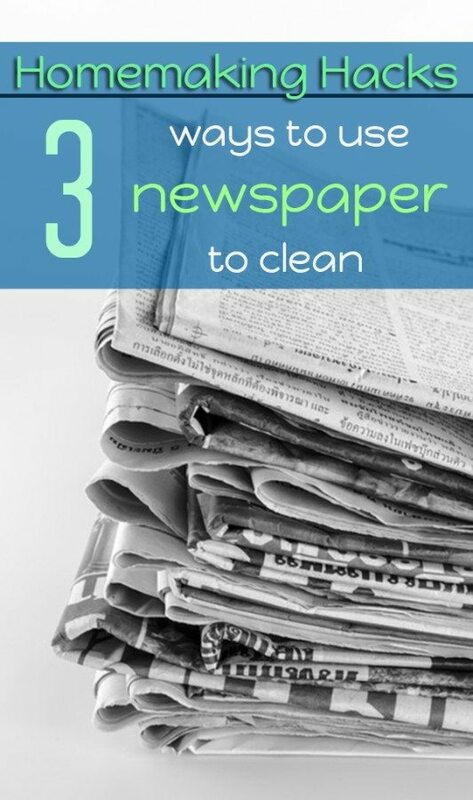 I never knew you could use old newspapers to clean. All 3 of those tips are useful to me. Thanks for the post.